﻿New Year’s Eve, 1970 was a memorable day for me because two things happened on that date that was significant in my life up to then. The first event was that we received a measurable snowfall, which in Georgia is about as rare as a day when traffic jams don’t occur in downtown Atlanta. The second and certainly more noteworthy event was that I received a late Christmas present, one that I had asked for but which did not arrive under the Christmas tree (which in hindsight was probably a very good thing) and that was my very own brother. Since then, a modest number of snowfalls have occurred but the arrival of a sibling was, for me, a once in a lifetime gift that would never be repeated. He arrived virtually on a holiday and only a matter of hours separated him from being a 1971 model. With Atlanta experiencing the combination of a snowstorm, New Year’s Eve and all that goes with that, as well as the Peach Bowl of 1970 all going on in the same period of hours, it was not the best time for Dad, usually an excellent driver even in bad weather conditions, to be dealing with snow, other drivers and a wife in active labor. Fortunately Uncle Mack and his family were over for the post-Christmas week and he was able to go with them while Aunt Jean stayed with us. They arrived safely at the hospital and a short while later, my four and a half-year reign as the center of the universe came to an abrupt end. Although I knew he was due in December, nobody knew exactly when he would arrive or even if he was going to be “him” or a “her”. 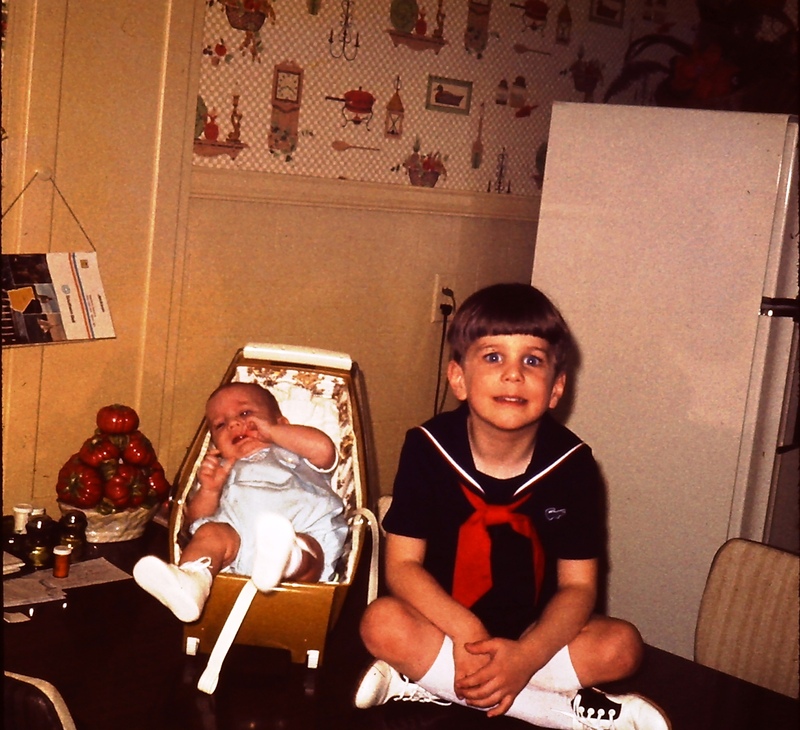 This was still a few years before ultrasonic tomography made it possible to determine the gender of a baby so like other expectant families of the time, we had to wait until the actual delivery to know for sure-still, I was very happy when I was told I had a baby brother. Of course, my expectations of what having a younger brother meant and the reality of the situation were very different because he didn’t just come “out of the box” and ready to play with…in fact, he was quite fragile, he couldn’t talk, he made lots of noise and he rarely slept for the first year, hence the aforementioned noise. My parents in later years would say that if he had been born first instead me, there would have been no second child as he kept them awake and going most of the time. I was shipped off to the guest room at the other end of the house so I at least could get some sleep but sometimes when he would start crying, I would come back in our room and talk to him and he would stop long enough to hang on every word I said. Somehow he knew we were linked even if he didn’t know what that link was yet. As he grew a little older but before he could actually talk, he began to communicate back to me and my mother always told me that I could understand his grunts and noises and would frequently be called upon to interpret what he was trying to get across. He had a limitless supply of energy that could have powered a small town if it could have been harnessed and he could crawl faster than you could think and get into something faster than that so he had to be watched all the time as he learned to explore the world around him. My grandfather, who always had a hard time keeping his grandchildren’s names straight frequently called him “Lightning” and “Scooter” because he could get around so fast and I spent a lot of time chasing him around and dragging him out of stuff he shouldn’t have been in. He liked bright things and was always drawn to anything that was colorful and noisy. He also had a terrible temper when he got mad and would scream so loudly and with such a shrillness of sound that it is little wonder today that I still put my hands over my ears when I hear a baby start shrieking. I started to school just a few months before he arrived so I no longer had my mother’s undivided attention all day like he did so there were some jealousies and sibling rivalries along the first few years and yes, sometimes I could be downright mean to him-but nobody else was allowed to. As we grew older, we began to actually play together and of course I always asserted my senior status in directing what would be played with and how playtime would be accomplished. He usually went along willingly with most of my schemes and our room usually looked like a battleground of overturned cars, wrecked buildings, crashed planes and scattered Fisher Price Little People (the original ones made of wood that had no arms or legs and were like a peg with a head on it). On nice days, we would play out in the front yard inside an expandable round fence that could easily choke a small child if he got his head stuck in it, which he would try to do sometimes if I stepped over and left the fence area for any reason. What did we ever do before child safety was thought of? His first pet was an English bulldog named Winston and I say it was his pet because it became the life ambition of that dog to protect my brother from doing something to get himself killed or seriously injured his first few years. My brother would try to ride the dog, wrestle with the dog and torment him with Tinker Toys and Winston would always come back for more, happily licking his face and even getting in the portable play pen with him, whereupon my brother would throw his arms around his head and hug on him. The dog actually saved his life one day when he got loose in the yard and took off running towards the street with a car coming but was intercepted by Winston who wouldn’t let him go any further. Winston’s last moments on earth were chasing my brother and his neighborhood friends some years later on their bikes when he was struck by a vehicle and he always held a special place in our hearts for his loyalty to my brother. The years where I was between 10 and 16 and he was between 5 and 11 were not always easy ones in the relationship of my brother and I and we had more than our share of arguments, bickering and fighting. He was, by nature, the better of the two of us, more kind and more considerate of others and less prone to get into things he shouldn’t. He managed to avoid getting in trouble nearly as often as I did, although part of this was that he was better at not getting caught-but I will admit, without going into a lot of detail, that I was not always a good “big brother” to him either. The things that came naturally to him were things I struggled with, like good grades, athletics and a desire to work in the family business and save his money up. He could be dogmatically persistent about achieving his goals whereas I had a hard time figuring out what my goals were in the first place. These differences that existed, almost like a competition between us (which it really wasn’t) defined our early relationship as being more about what made us different than what made us alike. The transition we slowly made from focusing on our differences to building on our common interests would make a lot of difference in the later years. When I got my driver’s license and a car, I was given more responsibility in being the one to pick him up and drop him off at various things and we spent a lot more time together. We discovered that we had more in common than we thought and mutual interests developed such as the infamous family automobile bug that afflicted us both during that time. We both loved cars and we could talk cars for hours on end if we wanted to. I enjoyed (and still do) a fascination with collecting wristwatches and he caught that bug as well, plus we liked video games and we both liked golf, although as a golfer, he was a good player and I just played at it-but we enjoyed the time out in the golf cart where all of life’s problems could be discussed and solved. More importantly though, we became aware of our common family interests and how family dynamics from multiple generations played a role in molding who we were. He was more like Dad because he worked alongside him for years and they thought alike on many things, enjoyed watching sports-related events on television and shared similar traits such as being pragmatic, focused on business interests and able to deal with a variety of personalities that they encountered in the business. I on the other hand was more like my mother; creative, impulsive at times and more comfortable devouring books, magazines and anything else I could find to put into my brain. One common trait we both had though was our sense of humor that many others had a hard time following at times. My mother used to say that our humor would feed off each other to the point that I could see something that struck me as terribly funny and he would know exactly what I was thinking and our banter would start from that point and escalate. Dad also had that same type of humor and on more than one occasion my mother would wring her hands of all three of us in exasperation. Even so, our genetics still made sure that we shared many of the same personality traits, from certain facial expressions to the ways we did things. We were both a mixture of identical DNA, traits acquired from different people and unique individuality. When my brother found life at the area community college to be uninspiring (we both likened it to the “13th grade), I advised him to seek admission to the University, certain of his admittance given his high academic ranking at his high school graduation. I didn’t take into consideration how much I would miss his being around when he actually loaded up the car and headed off to get a real college experience at the largest school in the state, nearly two hours away. During the next four years, I made many trips over to Athens on weekends to visit him and we would go look at cars, go to the mall or hit a local downtown restaurant for dinner. I always enjoyed our visits and seeing how he changed as a mature college student and how he discovered new interests that he hadn’t known he had, all while making new friends from other states and other countries and finding his independence. He worked jobs while he was there to supplement his income and he moved more times than I could count, always landing on his feet and moving forward. After college, he lived and worked in Atlanta for a few years and I would go up there and visit him after work for an evening of dinner and drinks while we would catch up on everything. Later, he decided that Athens was where he loved to be and he and my father brought the family business over there, which he has been operating ever since. In 1999, he got lucky and became the first of us to get married, finding a soul mate who has been a devoted and supportive wife to him ever since. A few years later she gave him two sons that he absolutely dotes on. I enjoy watching my two nephews when they come for a visit because the older one bears a strong resemblance to me and the younger one bears a strong resemblance to my brother and seeing them together is like watching our distant past. I don’t think they yet realize how lucky they are to have each other but I think someday they will understand that when you have a brother, there is another person out there that is, in many ways, just like you but also different. A sibling (when both have the same parents) shares the exact same DNA with you, the same lineage, the same environment and is the person with whom you will always have the most in common with, even if your personalities are entirely different. Nobody can ever take the place of a brother or a sister because you are bonded from the time of their birth to that person through the very strongest of family blood. My brother is very different from me in a lot of ways but we are very much the same in other ways, not just biologically but in shared experiences and common journeys travelled. Forty years ago today, I became a brother by gaining a brother. There are a lot of things, given the vantage point I have now, that I would have likely done differently if I were able to relive the last four decades over and there are certainly incidences where I wish I had possessed the wisdom to give better counsel and advice to him but I imagine there are probably a lot of older brothers and sisters out there that could say the same thing…..but I still would not trade anything for where we are today and the relationship that we share, even though we live in different places and have very different lives. Becoming a brother was a singular, defining point in my life, challenging at times for us both but overall rewarding. It probably was the greatest thing that ever happened to me up until I became a husband and later, a father. I am proud of my brother and the life he has forged for himself, proud of the values he adheres to and the things he believes in. You can learn from a younger brother and I have learned from mine as I have watched him grow from a newborn to the man he is today. I hope as time goes by that I can still find much to learn from him and that along the way, he will still learn something useful from his older brother who still remembers the thrill of meeting him for the very first time. A very happy 40th birthday to my brother and my very closest friend. Michael, what an inspiring story. I really enjoyed it and hope other older siblings will take heed to your story. Happy New Year to you and your family! How wise of you to realize the gem you have in your relationship to your brother. Danny and I were not close until I moved back to Jackson 12 years ago. How bittersweet to have come to love him dearly and then to lose him.